The infant Har Rai was born in Kirat Pur and received his name from his grandfather, Guru Har Govind (Gobind) Sodhi. Har Rai had one elder brother Dhir Mal. His mother Nilhal Kaur, was the wife of Gur Ditta, the eldest son of Damodari and Guru Har Govind. To the dismay of Dhir Mal, his grandfather decided that his youngest grandson proved to be the most suitable of his lineage to be his successor, and appointed Har Rai to be the seventh guru of the Sikhs. History shrouds the exact events of Har Rai's marriage in conflicting chronicles and oral accounts. Several records indicate that Har Rai was married, at about age 10, to the seven daughters of the Sikh Daya Raam of Anupshahr who lived on the banks of the Ganges in Balundshahr District of Uttar Pradesh. Oral history suggests that he wed only Sulakhini, the daughter of Daya Rai a Sillikhatri of Arup Shanker. Another document states he wed four princesses and their handmaids. All indicate the same date. Har Rai fathered two sons and a daughter. Guru Har Rai appointed his youngest son, Har Krishan, as his successor. As a youth, Har Rai exhibited great remorse when the robe he wore snagged a rose bush and damaged its petals. Guru Har Rai learned the medicinal properties of herbs. He tended to injuries of animals which he found wounded and kept them in a zoo where he fed and cared for them. When appealed to for help by his enemy, Mughal Emperor Shah Jahan, Guru Har Rai provide a cure for his eldest son, Dara Shikoh, who had been poisoned with tiger whiskers. The Guru demonstrated, that the actions of others ought not to dictate those of a Sikh, and like a sandalwood tree perfumes the ax which cuts it, the Guru returns good for evil. As a youth Har Rai received marital training and became adept with weapons and horses. Guru Har Rai maintained a militia of 2,200 men at arms. The Guru managed to avoid confrontation with the Mughals, but was drawn into the intrigue of succession when the Mughal emperor's heirs fought over his throne and the eldest, Dara Shikoh, appealed to Guru Hair Rai for aid. The Guru incurred the displeasure of the ruthless younger brother, Aurangzeb, by detaining his army when he pursued Dara Shikoh. Meanwhile the Guru counseled Dara Shikoh that only a spiritual kingdom is everlasting. Aurangzeb eventually took over the throne. Aurangzeb imprisoned his ailing father and had his brother, Dara Shikoh, put to death. Fearing Guru Har Rai's growing influence, Aurangzeb summoned the Guru to his court. Not trusting the treacherous emperor, the Guru refused to comply. The Guru's eldest son, Ram Rai, went instead. The Guru blessed him and requested that he not yield to pressure from Aurangzeb to alter the words of the Granth Sahib. However when Aurangzeb asked for interpretation, Ram Rai faltered and changed the wording of a passage, hoping to curry the emperor's favor. 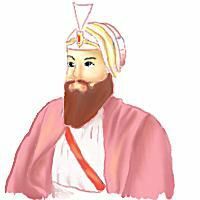 Consequently, Guru Har Rai passed over Ram Rai and appointed his youngest son Har Krishan to succeed him as guru. Spouses and Progeny – Dating influenced by historic obscurity and conversion from Vikram Samvat (SV) to Gregorian (A.D.) and Julian Common Era (C.E) calendars, and obscure sequencing of various historians. Standoff with Mughals: Gowindal - Late June 1658 A.D. Guru Har Rai receives Dara Shikoh. Sikh militia intercedes on his behalf and delays the pursuit of Aurangseb's armed forces.